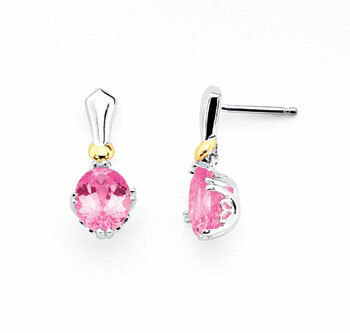 Pink Sapphire earrings, sterling silver and gold accent, lots of fun to be had here today! From Ostbye’s Reflections of Color series these petite dangle earrings feature pretty Lab Created Pink Sapphires set in sterling silver with a touch of 18k yellow gold. Post style earrings with friction backs. Matching Pendant is available by special order; please call or email for details.